We’ve seen it many times before, a mainstream house releasing a series of fragrances based around a single concept. Sometimes it works really well (see Guerlain’s L’Art et la Matiére line or Chanel’s Les Exclusifs) and sometimes it fails epically (see Dolce & Gabanna’s Anthology line). Usually lines launched with multiple fragrances are a bit hit and miss, they tend to have one or two ‘greats’, more than a couple of average ones and a their fair share of clangers. So it is with trepidation that I approach any new ‘collection’. I am very familiar with Molton Brown’s line of shower gels, hand creams, hand washes and body products (which I think are generally very good btw) but I have to admit that I’m not overly familiar with their stand-alone fragrances, so this collection could go either way for me. As mentioned above, there are five fragrances in the Navigations Through Scent series; Iunu (London via Egypt), Lijiang (London via China), Singosari (London via Indonesia), Apuldre (London via Kent) and Rogart (London via Canada). This is a review of just two fragrances from the collection – Lijiang and Iunu. Lijiang smells exactly how you would expect an osmanthus and white tea scent to smell. It starts out very dewy and floral. I don’t detect any of the pink berries but I do get a lot of the ‘vegetal’ notes, however I wouldn’t necessarily call them vegetal, they aren’t as green, I would say they were more mineralic. As Lijiang settles it becomes lighter and fresher, the mineralic notes intensify and the musk comes along to round things off nicely. If there is any vetiver then it’s doing a very good job of hiding itself, every now and then I get a tiny flash of something a little rooty, but that’s the extent of it. My problem with Lijiang is that it just feels a bit obvious, as if they thought ‘Right, what’s evocative of China? Osmanthus and Tea? That’ll do!’ That wouldn’t have been a problem for me if they had done something interesting with the notes, but Lijiang is a heck of a lot like most osmanthus fragrances out there and it certainly doesn’t fit the bill as being ‘distinctive’. All of that said, it does smell nice and if you’re not familiar with osmanthus then I think Lijiang would be a good starting point, it’s pretty, light and although I find it underwhelming it doesn’t smell bad. If I were to sum up Iunu in a nutshell I would call it ‘A Diet M7’. It is impossible to smell Iunu and not think of YSL’s absolutely fantastic M7. Where M7 is a heady woody oriental, Iunu is a lighter, spicy woody oriental without any of the oud or vanilla, hence it being a ‘diet’ version. Iunu starts with lots of pepper and ginger, there is a good mix of spice and woods to keep my interest. The elemi adds a lime facet that stops the opening from being just spice and woods. The florals are pretty subtle, they don’t really come through too much, mainly because the patchouli in the base is so strong. I think they’ve achieved the right balance with the florals, I wouldn’t want too much jasmine or ylang ylang to barge in and take over, as they so often can do. Iunu is pretty linear, it starts out spicy but warms up with the patchouli and woods pretty quickly. Oakmoss is listed in the base and I wish I could smell it, a nice dose of moss would round things off nicely and would have been a nice surprising addition to the base, alas it wasn’t to be. I like Iunu, it’s much more interesting than Lijiang and whilst I don’t think I’ll be running to my nearest Molton Brown store/concession to buy a bottle, it has piqued my interest in the other three fragrances in the line, lets hope they are as good! All fragrances in the Navigations Through Scent series are available in 50ml Eau de Toilette for £65. The Sample Giveaway has closed. 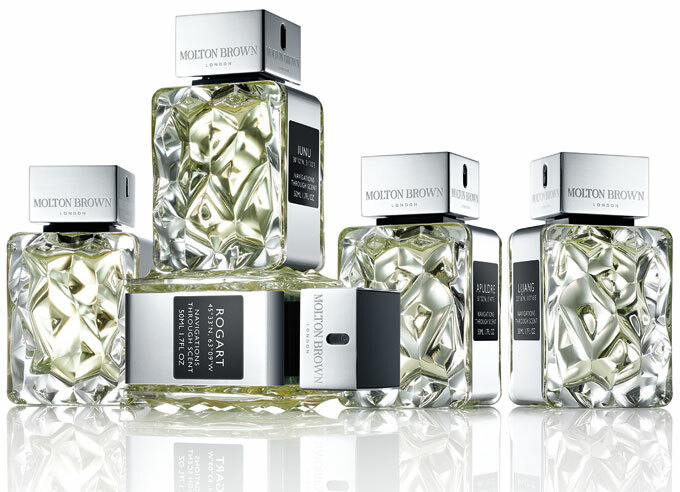 This review is based on samples of Lijiang and Iunu obtained through the Molton Brown Facebook page. Posted in Citrus, Floral, Molton Brown, Unisex, Woody and tagged Citrus, Iunu, Lijiang, Molton Brown, Navigations Through Scent, Osmanthus, Tea, Woody. Bookmark the permalink. Do you think Lijiang bears a resemblance to Osmanthe Yunnan? There is a slight resemblance but Osmanthe Yunnan feels a bit lusher and fuller. Lijiang is light and airy. Lunu and Lijiang sample Giveaway. Hi please enter me in the draw.I would love to visit India and see the TajMahal. Hi Rene, thanks for entering. But both seem well, pale. I’d love to enter and try them though. I’d love to go to New Zealand too! Great choices! We have some very good places to visit over here! I would love to visit Rio de Janeiro. I still haven’t smelled L’ artisan Batucada to see if it is good enough to beam me there. The Anthology line is absolutely dire, as are most D&G’s in my opinion! Rio would be amazing, it looks like such a vibrant place! I’ve only tried Batacada very briefly, it’s interesting – citrus with a weird lactonic vibe. You’ve been entered into the draw. Me too, China would be awesome! The place I would like to visit most is Ireland. It is just so green and lush, I bet it smells great there too! I’d love to win the samples, I’m a perfume addict and would love the opportunity to try these!! Ireland looks beautiful doesn’t it?! Having read the descriptions Iunu sounds lovely. I have always wanted to see Petra, in Jordon. It looks so amazing, once a gateway to a kingdom -and is now such a dry, deserted place, still beautiful. Jordan would be a wonderful place to visit! The Transsyberian journey would literally be epic, I would LOVE to do that too!